I love my coffee. Obsessed may be a better way of putting it. But on an ‘it’s-10am- already-had-three-coffees-and-still-feel-hungover’ kind of day, I decided to try the hot spiced apple for a change. It’s like mulled cider minus the alcohol, so totally acceptable to drink at whatever time of day! 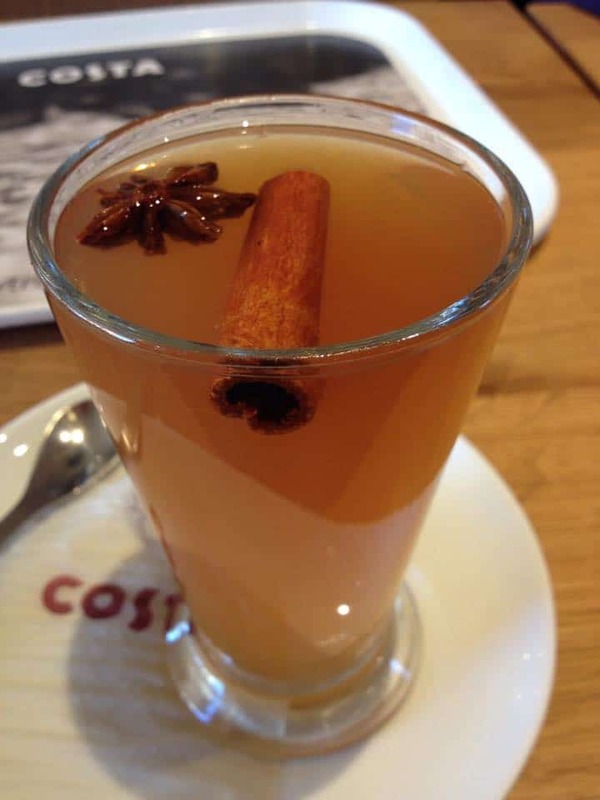 I love the cinnamon and star anise floating in the drink, it feels so festive and will warm you right through during late night shopping trips or a frosty walk. I have done a lot of gluten free mince pie taste-testing over the last few weeks. I feel it my duty, really, as a gluten free blogger, to find the best free from mince pies out there! With rich buttery pastry and a dollop of sweet, succulent mincemeat, these Marks and Spencer gluten free mince pies are the pick of the bunch. They’re probably the least ‘distinctively gluten free’ mince pie out there, if you catch my drift, and with a dusting of sugar they are so deliciously moreish. Don’t fancy Christmas pud? Fear not – these are THE ultimate choice for those coeliacs with a sweet tooth! 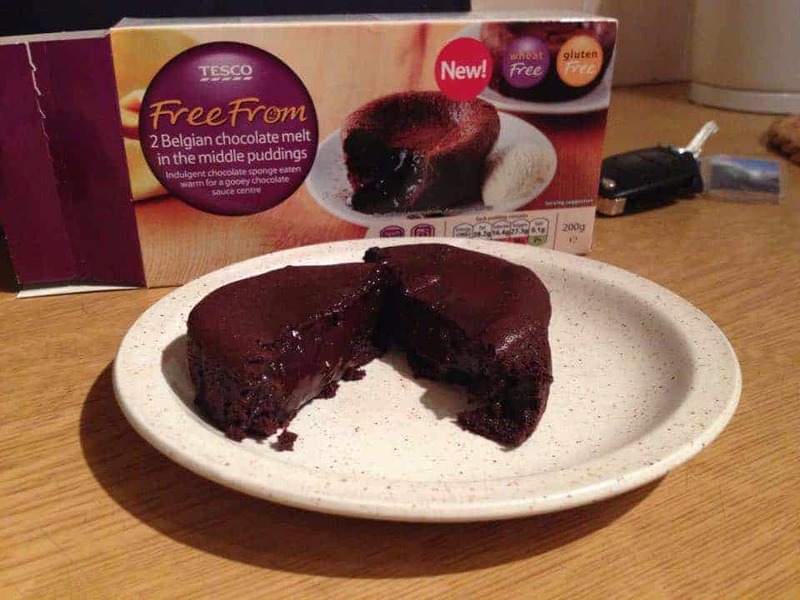 I’ve always been dying to try a melt-in-the-middle pudding and couldn’t believe my luck when I spotted this chocolate one in the Free From frozen aisle at Tesco. I wondered if it might taste a bit crap (I always seem to prepare for disappointment with these things!) but it was absolutely amazing! Hot, gooey chocolate oozing from a surprisingly light cake – pure gluttony, but the ultimate indulgence for the festive table. I am seriously in love with Glampig. Not only do they come up with some of the best hashtags I ever have ever seen (#getyourhandsonmysausage) but their sausages are AMAZING and whenever I see the guys at any of the food markets they are always smiling, no matter how chilly it is! 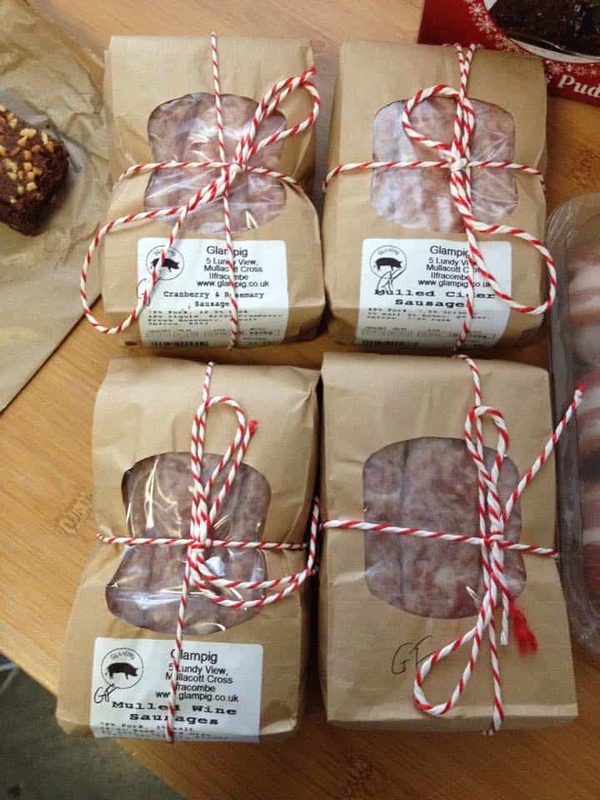 I’m a huge advocate of their sausages anyway, but this year they’ve got a whole festive range – including mulled wine and mulled cider flavours! Does it get any better than this? They can also make gluten free pigs in blankets and I’ve got some gluten free cranberry and rosemary sausages to try too – I cannot recommend these guys enough! Plus you can try my mulled wine sausage and bean casserole – delicious. 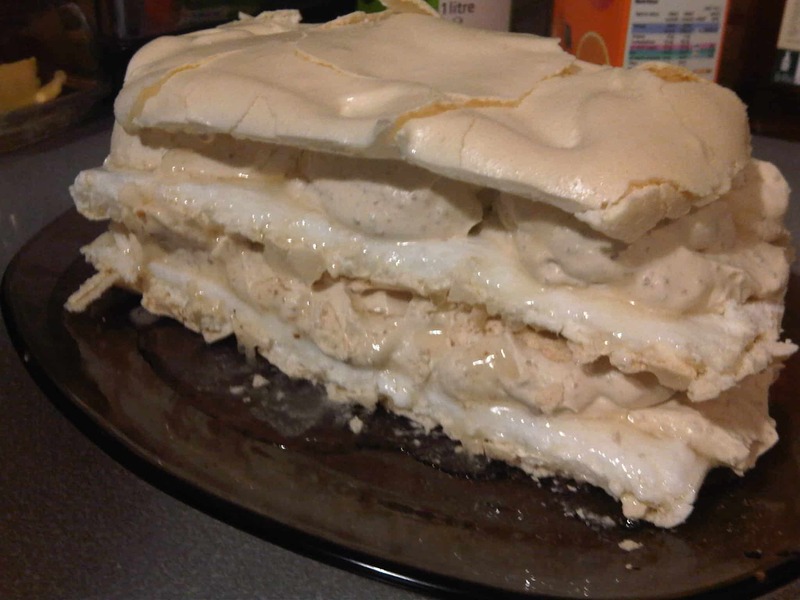 I made this gluten free Christmas dessert a few years ago and it was simply amazing. It doesn’t get more festive than chestnuts and Bailey’s, so sandwich the two in an indulgent meringue and cream concoction and it is actual heaven. I adapted the recipe in Phil Vickery’s Seriously Good Gluten Free Cooking book – view it here – and made a pudding which delighted the whole family for Christmas. I’d seriously recommend it! 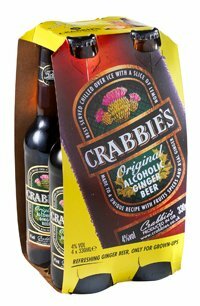 While the rest of the family kicks back with a beer, I crack open the Crabbie’s when it comes to Christmas Day booze. The rich ginger flavour warms you right through – I love sipping a few of these on Christmas Eve in front of the fire, waiting for Father Christmas to arrive! Ginger is definitely the ultimate festive flavour – and I love that Crabbie’s label their ginger beers as gluten free as well. Perfect. 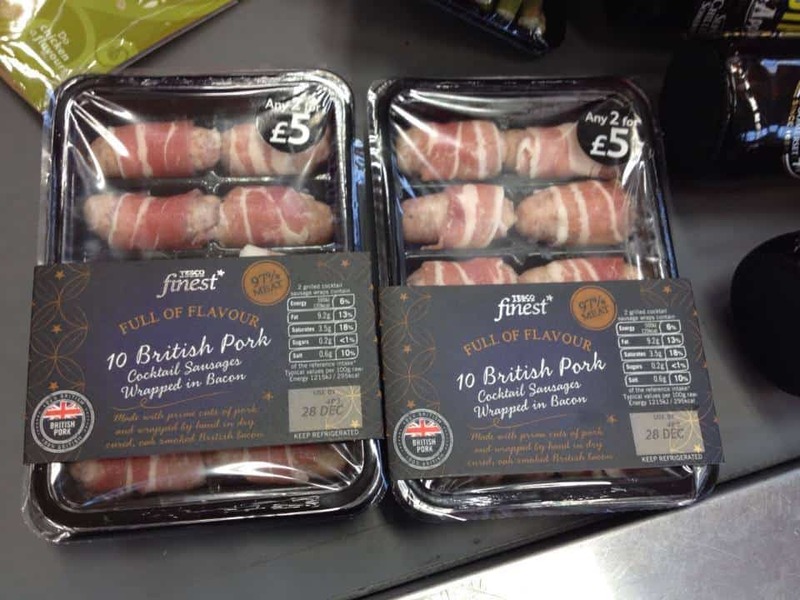 I was SO happy when I found Tesco’s Finest pigs in blankets were gluten free last year. Although I have opted for a different brand this Christmas, I can definitely recommend these. Normally we faff about making our own, but for the ease of just being able to shove these in the oven they were great. I managed to find them again this year and it’s nice to see a mainstream product which doesn’t have gluten in. I really hope M&S are doing these again this year. My lovely cousin got us some as a present and I may have scoffed the whole lot…. they were so good! The perfect mix of butter, crumbly biscuit and chewy cranberries with a perfect, fragrant Christmas spice, it’s guaranteed these cookies won’t last long at all. I love making my own gluten free Christmas biscuits, but the sparkly silver packaging means these make a lovely present or coffee table snack for the holidays. Just make sure you hide them away if you don’t feel like sharing! Mrs Crimble’s rules the roost when it comes to gluten free stuffing. But trust me, you need to get in there quick because this stuff goes like hot cakes! 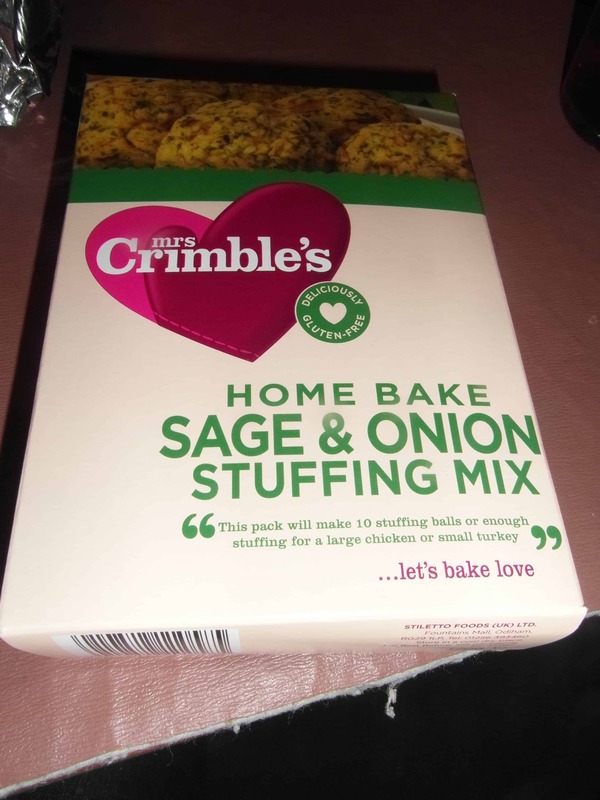 Mrs Crimble’s sage and onion stuffing mix is great – so easy to make and no one around the dinner table with ever know it’s gluten free. You could opt for making your own using gluten free sausage meat – always a big hit in our house – but when everything is a bit mental and you’re preparing to feed hoards of hungry people, this is a simple way to ensure everyone – coeliac and non – around the table will be happy! 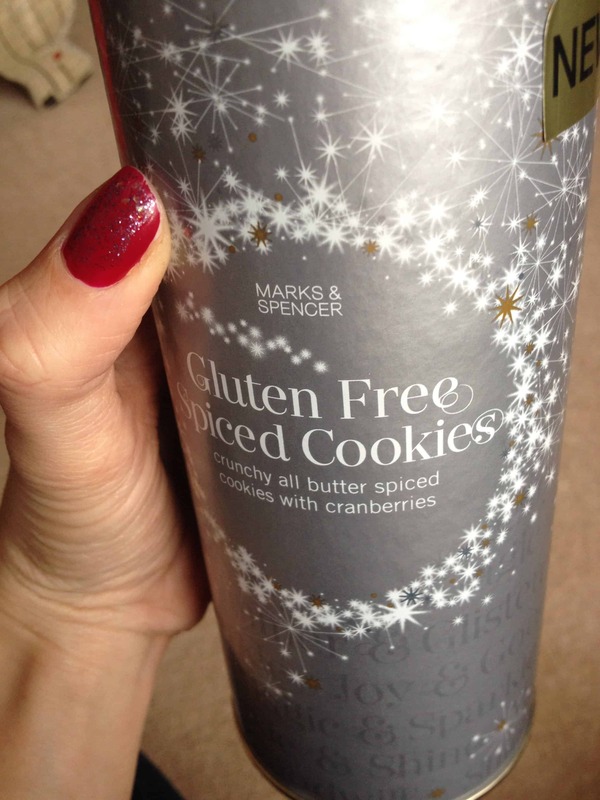 What are your favourite gluten free Christmas foods? If you think I’ve missed out something great, comment below with your suggestions! Next Post Discounted tickets to BBC Good Food Eat Well Show – a last minute Christmas gift? The Incredible Bakery Company is in the village of Warkton, Northamptonshire, their produce is allergen free. Bread, panini, muffin and mince pies are all delicious. Each month there is a allergy free fair in the village. M&S mini chicken kievs with gluten free breadcrumbs! M&S ready made stuffing (3 varieties all GF)! I’d have to add Sainsbury’s gluten free Icing Topped Mince Pies to the list. Very tasty and addictive. 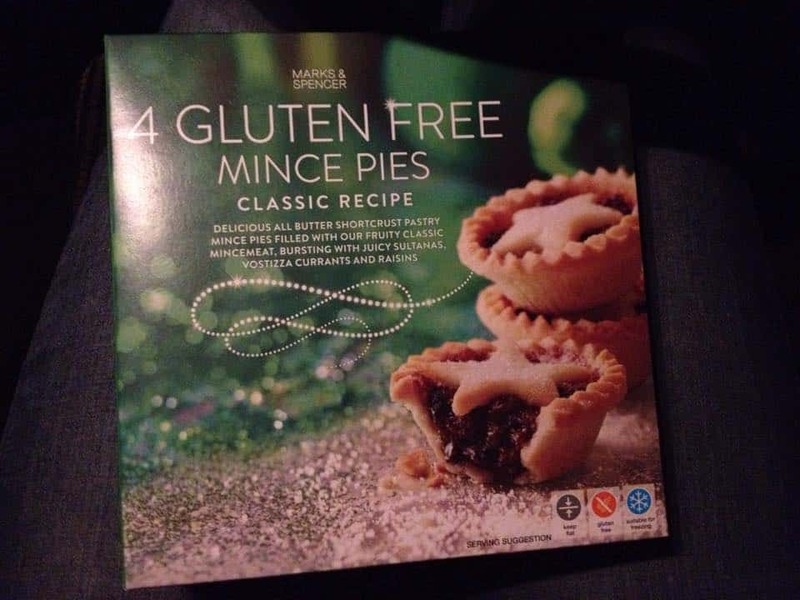 Just a shame there are only ever four mince pies in a pack for gluten free/coeliac buyers, rather than a ‘standard six’. M&S’s range of party food is great. The Great British Cheese Bites are delicious. Bought (and scoffed) some yesterday and will be buying a lot more this festive season.